Local cows love their Herr's potato chips, but does it make the beef taste better? Potato chips. Popcorn. Pretzels. Cheese curls. When you serve a bowl of snacks like these at a party, people eagerly devour them, licking the salt and cheese dust from their fingers after the treats have disappeared. Turns out, cows go nuts for these classic snacks, too. At Herr Angus Farms in West Nottingham, Chester County, the cattle grazing in the pastures also pig out on these salty snacks. 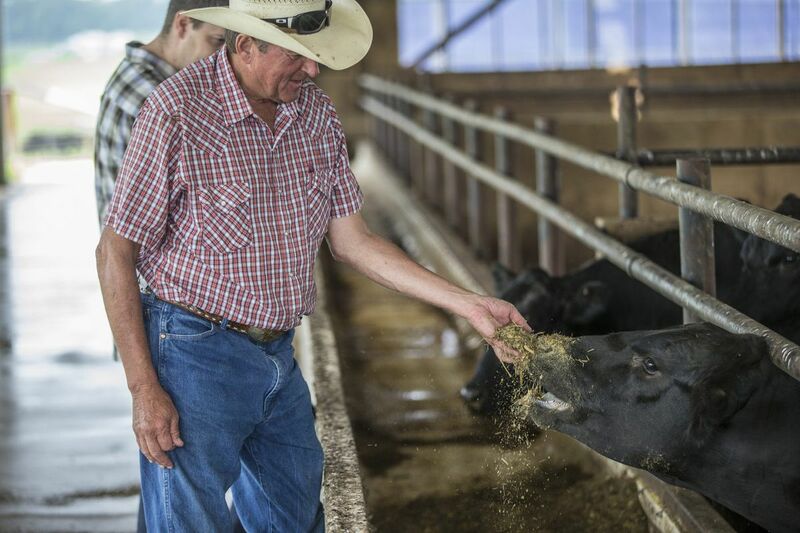 "We call it steer party mix," says Dennis Byrne, who has been farm manager for this herd of cattle since 1985. The farm is a division of Herr Foods Inc., the snack company. During a recent farm tour, Herr's delivery trucks passed by on the country road that runs between the farm and the nearby snack factory. Herr's makes the cow's party mix from morsels that weren't quite up to snuff — chips that were too small or oily, half-popped popcorn, pretzels that turned a shade too dark in the oven. Decades ago, Herr's paid to have these imperfect snacks hauled away. Then the farm came along, and the cows began to eat them, saving Herr's waste-removal fees and lowering feed costs. That impulse to use up what would otherwise be wasted aligns with the farm's raison d'être. It was created in 1983 as the recycling arm of the Herr's factory, when Jim Herr realized that the 500,000 gallons of water used daily for scrubbing potatoes could be reused to irrigate nearby pasture. Feeding the cows those rejected potato chips is another form of recycling. Until last year, Herr's routinely sold off most of these cattle as commodity beef or as breeder bulls and cows. Grass-fed meat, from local cows that spent their final days chowing down on chips and pretzels, was going into the same mass-produced frozen hamburger patties as factory-farmed cattle. A few of the Herr's cows, however, fed family and friends, including neighboring hobby farmer and retired DuPont plant manager Bill Pew. "The beef from these cows tastes great, is very tender, and, wow, what a great farm-to-table story," says Pew. He knew that within a 100-mile radius of the farm there were restaurants, butchers, and individual consumers who would pay a premium for this kind of local meat. Pew thought that connecting Herr's and these potential customers would be a good business, so he presented the company's current management with a plan to make those introductions and sales happen. The beef is now on the menu at a couple of restaurants in Philly — Talula's Garden and Urban Farmer. Both of these places have the square footage to accommodate half of a cow, which weighs roughly 450 pounds, and someone on staff with formidable butchering skills. "It's something really special. The quality is excellent," said Charles Parker, executive chef at Talula's Garden. "We also see this as an opportunity to offer our guests a super local product." As for the taste, he says, it has a "pronounced beefy flavor that is stronger than typical beef, but milder than lamb. I think the pasture contributes that dominant flavor. The party-mix finishing feed lends the more subtle things. For example, it has an unusual toasted cheddar note, and it's a little sweet." Meanwhile, in South Philadelphia, third-generation butcher Domenick J. Crimi was fielding requests for local beef several times a week. "And twice a day on weekends," Crimi says. His shop, Cappuccio's Meats in the Italian Market, has been around since 1920. It has seen many food trends come and go in its almost-century-long history. But this farm-to-table, locavore movement is more than just a trend, Crimi said. "The demand for local has been growing for a long time. It's only getting bigger." One customer in particular, Curtis Matthias, kept asking Crimi to stock local beef. "I go to Headhouse Farmers' Market every Sunday and other markets throughout the week," says Matthias. A local-food enthusiast, he loves cooking in his South Philly kitchen. Through an acquaintance, he got a cow share — one-quarter of a whole animal — from Herr Angus Farms. After he tasted it, Matthias knew he had to bring Crimi and Pew together to get Herr's beef into the Cappuccio's Meats case. That was six months ago, and now Crimi buys one half steer a month and plans to increase that come fall to a whole steer each month. He's the only butcher in Philadelphia to carry Herr's beef. "For the best cuts — rib-eye, porterhouse — there's usually a waiting list," says Crimi. "I dry age these for four to six weeks to get the best possible flavor and texture." These ultrapremium butcher's items cost roughly $30 per pound, a hefty sum, but for true meat lovers, the price is worth it. Well-marbled, emphatically beefy, and tender, these dry-aged steaks owe their character to a combination of extravagant Pennsylvania pasture, the unusual snack-filled finishing feed, and the butcher's skills. You'll need to special-request these cuts well in advance of when you want them, roughly 30 days. But let's say you want a taste of this local food — on a budget. "I actually like the Herr's ground beef best," says Matthias. Crimi is happy to grind it to order and to the customer's preferred fat-to-lean ratio. "I like 60 percent meat, 40 percent fat, a true butcher's blend," says Matthias. He uses it to make burgers, which he cooks medium rare for maximum juiciness and beefy flavor. The price for Herr's ground beef at Cappuccio's varies a bit depending on what you want, but it averages $6 a pound. That's a competitive price for this kind of meat. "The quality of this beef," says Matthias, "has definitely changed my diet for the beefier."